any news about new exchanges? and how much community already collected for them? do we need 2 btc only? or it is just for 1 exchange? A lot of devs go absent, probably more than 50%, and the community stays active and keeps the project alive. hi all! It was me (donator of 1 BTC) who was initially talking about the 2 BTC fee: https://bitcointalk.org/index.php?topic=2068554.msg28684008#msg28684008 However I have since changed my mind about Coinexchange. Also, a 4 BTC listing fee is not worth their exchange. Certainly there are other better options. The community shall discuss! Use the funds well... they were donated to be used wisely. Please discuss: what is your favorite semi-large centralized exchange? I think 2018 is the time for the decentralized exchanges to bloom and show what they've got. BUT centralized exchanges still remain crucial for volume nowadays. If people work and move together, getting listed on several ones is a very possible task. In fact this should be a very minor task. Great things can be achieved when people work together. Do not wait for things to happen, act. Great thanks flying out to all people who are doing something, you know who you are. I think exchanges are not very important. Decentralized ones are in the works. It's all about patience. The bounty are still in progress and Dropper is managing them. In the meanwhile we got some good proposal under github. It true that there have been not much activity in here lately but things are actually moving forward. I think in this phase (before the bounties are completed) if we just come up with good ideas and discuss them it's already a good step in the right direction. About the exchange i thought is too early at the moment, but if many people, like i saw few weeks back want it, now is time to act on it. 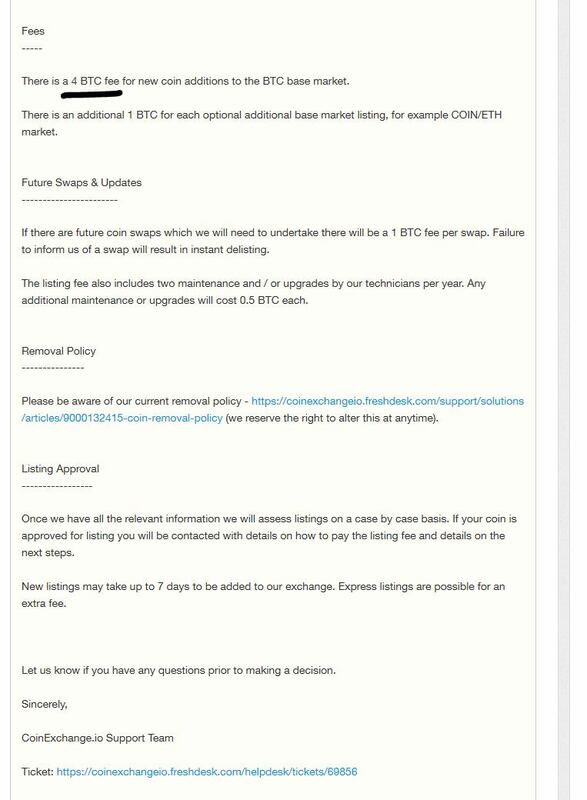 Now that coinexhchange increase their listing fees, we can consider Stock.exchange as a starting exchange, they are asking a 1 BTC fee for listing. Volume wise its not much, but thats a good alternative to etherdelta. also we can also take a look at coinsmarket i think they still list coin for free depending on the community behind it. I just wish nova exchange will return soon, its a good exchange for a startup community coin. so as i saw from previous posts, if we dont collect 2 btc till 22nd february there will be refund for all donators? and also if coinexchange is not the best option, what other options of 1-2 btc price do we even have? Hello all! Nice to see all of you still here. Are all of VR places soled out? you are right. 4btc is just greedy. what about https://www.lykke.com? they added a lot of coins and tokens recently. i will ask them via telegram how the chose a coin. i dont think that the chances to be added are huge. but i will give it a try. i talked to lykke exchange. here is what they told me. Lykke tries to add popular tokens at the moment. that they will send out a questionnaire and requirement of NDA. and here a quote too. ok I see. thanks for the info. I guess it will now be harder to rank up on bitcointalk. Though spam posts are likely to reduce significantly. Forget about ranking up on Bitcointalk, this is a feature of the past. Now you won't rank up beyond Member for several years to come I guess, if nothing will change in the new system. Yeah I think I agree with you. We will have to adapt to the new system. I just did another vote for MVT listing on next platform. Funny enough, I did the 900th vote. What a lucky number for me..lolz..
i think i know we could reach the 2 BTC fast. why dont you all donate the income of your signature campaign until 28th? Yobit offers a free inquiry to see if they would add it for free, but I know a lot of people don't like them. I only mention it as a third or fourth exchange. "Join Komodo slack, then ask for assistance , the dev team behind BarterDEX are extremely helpful, one of the best communities in crypto, jl777 sets a great example and leads by example too, hard working, always available to discuss things, good humored, patient. listing on BarterDEX is free, but TALK community needs to do some 'work' too, not like a centralised exchange where you pay $$ and they do everything for you." with 2 btc you can get listed on kucoin afaik and YoBit is good too, never had problems with them. If they list us, other exchanges will follow. well i guess coinexchange did this amount of 4btc to stop shitcoins being listed ><" thats what i think. I think kucoin is better than yobit. If most of users that get airdrop donate we can get funds for listing fee.